Entire state requires 9.0 psi RVP from May 1-September 15 on a retail level. Selected counties including Broward, Dade, Duval, Hillsborough, Palm Beach and Pinellas are required to use low-RVP gasoline in the summer months. (Originally expired 12/31/13 - retroactively extended through 12/31/16, by H.R. 2029) Fueling equipment for E85 installed between January 1, 2014, and December 31, 2016, is eligible for a tax credit of 30% of the cost, not to exceed $30,000. Station owners with multiple locations can use the credit towards each site. For more information about claiming the credit, see IRS Form 8911. The Rural Energy for America Program (REAP) provides grants and loan guarantees to rural (population less than 50K) small businesses to purchase renewable energy systems or make energy efficiency improvements. Eligible renewable energy systems include equipment used to distribute flexible fuels. The maximum grant funding is 25% of project costs and the maximum loan guarantee is $25 million. The program is funded through fiscal year 2018 but is subject to congressional appropriations thereafter. For more information, see the REAP website. 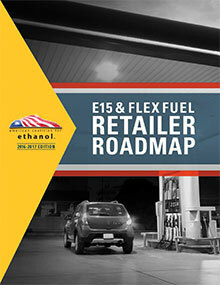 Want to see what E15/Flex fuels could do for your operation?